Have you seen the trailer for Hallowed yet? Hallowed is the much anticipated followup to Unearthly by Cynthia Hand which came out last year. Unearthly was one of the best angel books I have read and I will certainly be looking forward to the publication of Hallowed in January 2012. Cynthia will be doing a blog tour and she will be stopping by at Serendipity Reviews, so keep your eyes peeled. Angry Robot are developing a new imprint called Strange Chemistry which will be publishing books from September 2012. Strange Chemistry will be a global imprint dedicated to the best in modern young adult science fiction, fantasy and everything in between. The editor is the fabulous Amanda Rutter who used to blog over at Floor To Ceiling Books. I can't wait to see what books Amanda will bring us and I wish her all the luck in her new position. To find out more about Strange Chemistry, please click here. I recently received this email from Scholastic which I felt I had to share with you. It is about sharing the books you love and with each list you add, Scholastic will donate a book to a child that needs one. Read on to find out more. Live on The View this week, Whoopi Goldberg kicked off Scholastic’s “One Million Bookprints for One Million Books” Campaign – an initiative to donate one million books to kids in need through the literacy nonprofit Reach Out and Read. By joining Scholastic’s online book communityYouAreWhatYouRead.com, you can make a Bookprint – a list of 5 books that have shaped your life. And for every Bookprint, Scholastic Book Clubs will donate a book. It is that easy to make a difference this holiday season! With your help, Scholastic Book Clubs will donate up to one million books to Reach Out and Read, to help put books into the hands of children in need through pediatricians offices around the country. Now more than ever, Reach Out and Read needs our help. Recent government funding cuts has made it a major challenge for literacy organisations like Reach Out and Read to continue to get books into the hands of kids in need. Join Judy Blume, Malcolm Gladwell, James Patterson, Jodi Picoult,Suzanne Collins, and make your book print today! I am absolutely rubbish at keeping up with challenges but there is one I am considering joining next year. 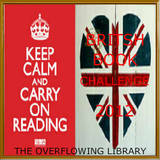 Kirsty at The Overflowing Library will be running the British Book Challenge for 2012 after Becky from The Bookette handed her the baton. This is the last Really Random Tuesday post before Christmas, so I look forward to telling you more news in the New Year. Good luck with the challenge! I'm also terrible at them but that doesn't always prevent me from joining more. What a wonderfully generous thing for Scholastic to do. This sounds like a great challenge, one I may join you in. What lovely bookish news and I hadn't seen the Hallow trailer before. I loved it! Unearthly is my very favorite YA angel paranormal. I LOVED the way Cynthia build the relationship in the story, it felt so real in comparison to a some of the insta love in PNR YA novels. I really stunk at challenges this year, so I'm thinking of laying low next year. Good luck with this reading challenge, Vivienne. Thanks for doing RRT; I'll link to this post the next time I do one. Thanks for your lovely comments everyone. Apologies for my absence, but Christmas has taken over the Dacosta household and I am left with little time. I hope to resume normal blogging routines after Christmas. Happy Christmas. Hope you and your family have a lovely holiday.